SDN (Software Defined Networks) and NFV (Network Function Virtualization) are today’s hottest areas of networking. Many executives, investors, sales professionals, and marketers need a solid working understanding of these technologies, but most books on the subject are written specifically for network engineers and other technical experts. 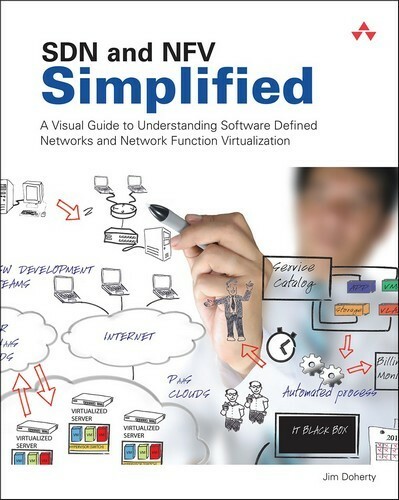 SDN and NFV Simplified fills that gap, offering highly visual, “at-a-glance” explanations of SDN, NFV, and their underlying virtualizations. Built around an illustrated, story-telling approach, this answers the questions: Why does this technology matter? How does it work? Where is it used? What problems does it solve? Through easy, whiteboard-style infographics, you’ll learn: how virtualization enables SDN and NFV; how datacenters are virtualized through clouds; how networks can also be virtualized; and how to maximize security, visibility, and Quality of Experience in tomorrow’s fully-virtualized environments. Step by step, you’ll discover why SDN and NFV technologies are completely redefining both enterprise and carrier networks, and driving the most dramatic technology migration since IP networking. That’s not all: You’ll learn all you need to help lead this transformation.